NREL has formulated an array-scale model which assumes edge effects are not significant with respect to the overall energy production for large PV arrays. 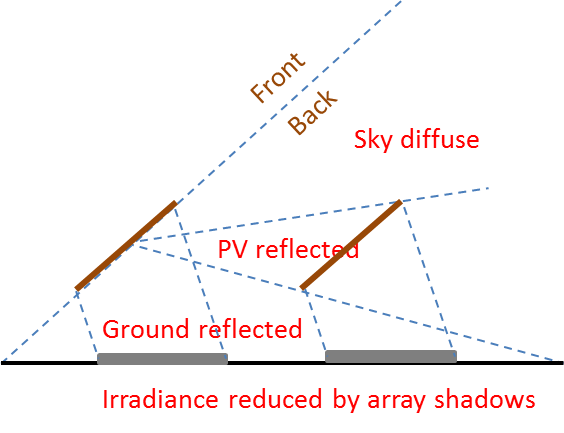 The figure illustrates the components of irradiance considered in the array scale model which include: sky diffuse irradiance from the visible wedge of the sky accounting for circumsolar, horizon and rest-of-sky diffuse irradiance; ground reflected irradiance accounting for shading of the ground by the array; and reflected irradiance from the front surface of adjacent rows. The array scale model can estimate variation in back surface irradiance along the vertical dimension of a module, but not along its lateral dimension.